Arrowlock (AL04), is a polypropylene security seal specifically produced for sealing plastic distribution and storage boxes, otherwise known as tote boxes or attached lid containers. 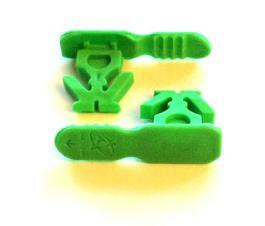 It is designed for manual removal and is supplied in multiples of five thousand seals. It is available plain, pre printed with sequential numbers or numbered pairs and is normally available for delivery within 2 days. The AL04 version featured here is chosen for its compatibility with the vast majority of tote boxes on the market. Please do not hesitate to contact us to check compatibility or discuss alternative options. 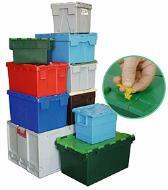 Plain @ £99.50 per box excl VAT. Numbered @ £145.00 per box excl VAT. Numbered pairs @ £145.00 per box excl VAT. * Please note, these products are only available to purchase online, for UK mainland customers. If you wish to purchase from outside this area please do not hesitate to CONTACT US FOR A RAPID QUOTATION. Prices exclude VAT & carriage which is added at checkout. Need a smaller quantity ? Contact us for options and pricing.